The most senior officers in the Army, Air Force, and Marine Corps are known as general officers. The most senior officers in the Navy are known as flag officers. The phrase “general and flag officers” or “GFO” refers to all officers in paygrades O-7 through O-10, thereby including onestar, two-star, three-star, and four-star officers. The U.S. Armed Forces is comprised of over 1 million service members either holding the ranks of officer or enlisted. While enlisted service members make up the bulk of the U.S. military, the role of the officer is a critical component to its success. Within the officer ranks there are several distinctions that help identify the types of officers across the branches of service. The most common type of officer is the commissioned officer. This service member receives his or her commission from either attending a service academy such as The United States Military Academy, participating in a Reserve Officers’ Training Corps (ROTC) program, or successfully completing Officer Candidate School. Regardless of the path a service member takes to earn their commission all officers must possess a college degree. There are two exceptions for the college degree requirement: Limited Duty Officers and Chief Warrant Officers can be commissioned officers initially without a degree, but further promotion will require that they obtain a college degree. There are three leadership levels within the commissioned officer ranks. Once an officer receives his or her commission they become a junior officer also known as a company officer. Company officers hold the pay-grade of O-1 to O-3. As the service member rises through the ranks and gets promoted they enter the leadership level of a field grade officer. Field grade officers are normally within the pay-grade of O-4 to O-6. Finally, the most senior level of officer leadership is the general officer. Service members that have reached this level are promoted to pay-grade O-7 and above. While the purpose of the U.S. Armed Forces is to protect and defend against threats both foreign and domestic there are several differences in rank structure within each service branch. For example, each branch (Army, Air Force, Marine Corps, Navy, and Coast Guard) have commissioned officers. However, the ranks within these branches are occasionally different. For example, the non-naval branches such as the Army, Air Force, and Marine Corps normally refer to officers that hold a pay-grade of O-7 and above as General Officers. However, the term Flag Officer can generically be applied to a non-navel officer who has reached the pay-grade of O-7 and above since they are authorized to fly their flag at their headquarters or on their vehicles. In the Navy and Coast Guard though the term Flag Officer is more accepted and common. In the Navy and Coast Guard, officers who hold a rank of either Admiral, Vice Admiral, Rear Admiral, or Rear Admiral Lower Half are known as Flag Officers. This corresponds with pay-grades O-7 and above. Another important distinction between the naval officer ranks and non-naval officer ranks can be seen in their position titles as well. In the Army, Air Force, and Marine Corps an officer holding the pay-grade of O-7 is known as a Brigadier General. However, in the Navy and Coast Guard they are known as Rear Admiral Lower Half. 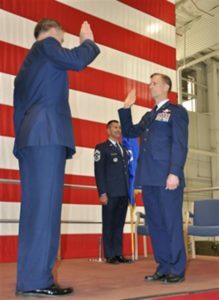 In addition, a Rear Admiral in the Navy and Coast Guard corresponds to a Major General in the Army, Air Force, and Marine Corps while a Vice Admiral holds the same pay-grade as a Lieutenant General in the Army, Air Force, and Marine Corps. The highest officer distinction in the Army, Air Force, and Marine Corps is a General, but in the Navy and Coast Guard the equivalent is an Admiral. Primarily, senior naval officers with a pay-grade of O-7 and above are known as Flag Officers while senior officers in the Army, Air Force, and Marine Corps with a pay-grade of O-7 and above are known as General Officers. Also, regardless of branch of service all senior officers with a pay-grade of O-7 and above can generically apply the term Flag Officer to their position title as they are authorized to fly their flag in appropriate areas and under certain conditions. At any given time there are about 1,000 active-duty GFOs.